Meze or mezze (Arabic, مَزة, Greek mezé (μεζέ), Bulgarian мезé mezé, Macedonian мéзе méze, from Turkish meze, all from Persian maze (مزه) 'taste, snack' < mazīdan 'to taste') is the name for a number of small dishes or appetizers served before a meal, often with a drink. They are common in the Eastern Mediterranean. Drinks include anise-flavored liqueurs, such as arak, ouzo, raki or different wines. These dishes are similar to the tapas of Spain or finger food. In Levantine cuisines and in the Caucasus region (especially in Armenia and Georgia), these dishes are served as a part of any large-scale meal. 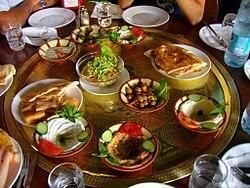 When not accompanied by alcohol, meze is known in the Arab world as muqabbilat (Arabic for "starters"). ↑ Alan Davidson, The Oxford Companion to Food, Oxford University Press, 1999, pp. 500-501. This page was last changed on 22 November 2014, at 07:45.